It was ROT Rally again, this past weekend. 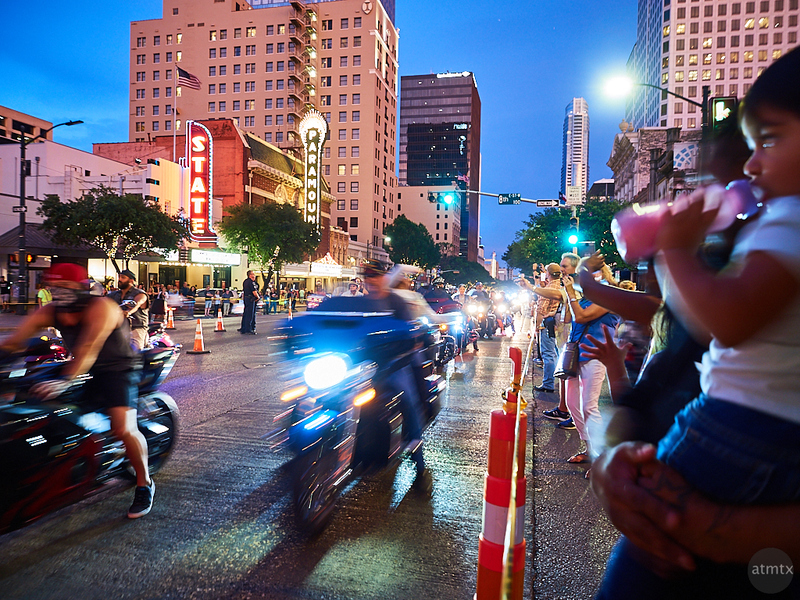 I was downtown, as usual, to catch the big parade on Congress Avenue. I noticed this last year, and it was true again this year — the crowds were definitely thinner. Years ago, when I first started going, it was packed throughout the parade route. The heart of the ROT Rally happens east of downtown, at the Travis County Expo Center. I’m not sure if it’s gotten larger there, but it seems like the downtown event has lost a little steam, at least from the onlookers. Photographically, however, it’s just as good as ever. But basically it’s the same thing every year. And there lies the challenge. What can I do to make things different? Doing the same thing every year is not very exciting or challenging. A year ago, I was playing with my new Panasonic ZS50 travel zoom, which I nicknamed the Photo Sketchbook. I really pushed that modest camera and shot a variety of subjects at different focal lengths. I even shot the 2016 ROT Rally Parade with all the limitations of a slow point and shoot. It certainly forced me to improvise. This year, I’m back with my usual two Olympus cameras. Nothing super-creative but I’ve embraced motion blur again and shot wider than usual. I could’ve posted a bunch of similar photos but this one is representative. Standing at my favorite spot, with the Paramount and State Theaters in the background, the 24mm equivalent pulls in the spectators. I think you get a good feel of the parade. I’m starting an ambitiously long series today, centered around the ROT Rally. With a variety of styles and techniques, which I’ve experimented with this year, hopefully, it will all come together. I shot all images, last Friday, during a four-hour period using the Olympus PEN-F with the Panasonic 25mm f1.4, as well as an Olympus OM-D E-M5 Mark II with the 12-40mm f2.8 Pro. There were a lot more music attractions at the Expo Center this year. I can’t speak for others but I opted to skip the parade in favor of enjoying the music. Plus, parades aren’t much fun on air cooled motorcycles in my opinion. Slow moving parade traffic means the rider gets extra toasty. You should come out to the grounds sometime. It would be photo heaven for you. Perhaps, next year. It’s getting challenging to find something new at the same event, year after year.